Born to Spanish farmers in 1713, Miguel Jose Serra was fortunate enough to be educated by Franciscans at their monastery. He became a novice at the age of 17 and took the name Junipero in honor of St. Francis’ brother companion. 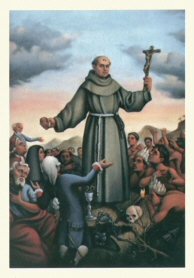 Serra continued in his studies and became a priest in 1938 at the age of 25, later obtaining his doctorate in theology. He soon after felt the call to become an Indian missionary in the Americas. Beginning in Mexico, he spent years preaching to the Indian population, building mission churches and teaching religion. Despite the controversy of his strict nature and advocacy of punishment, he provided for the physical needs of the native people. He helped introduce domestic animals and promote agriculture and commerce. He also defended the rights of the native peoples throughout Mexico. He continued in his mission for decades, spreading into California. He baptized thousand and built innumerable missions, stopping his work only with his death at the age of 70.